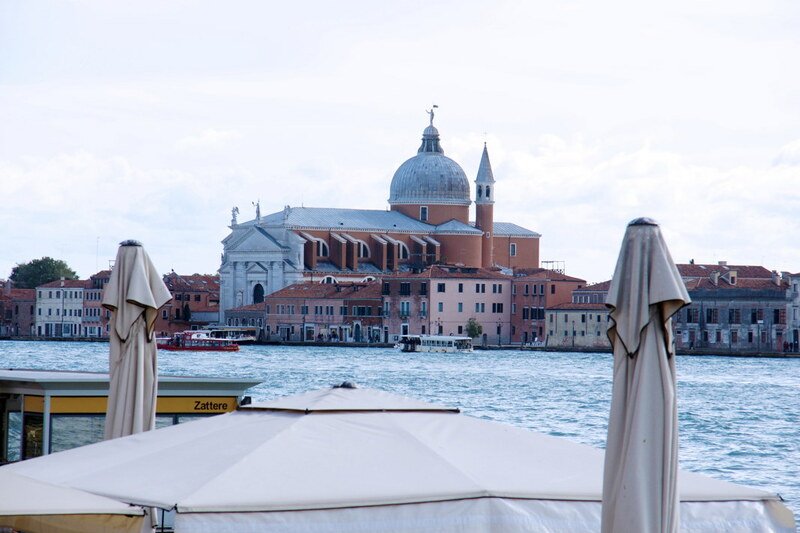 Venice has long fascinated travelers, both active and armchair. 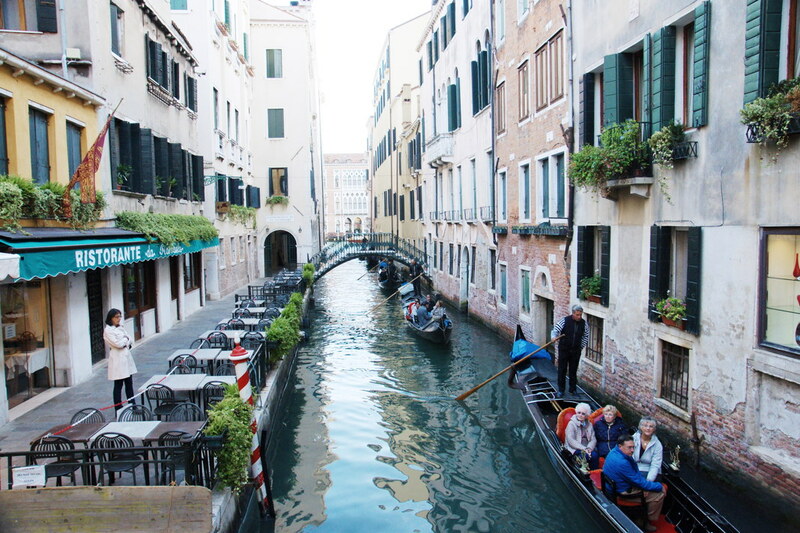 The canals, alleyways, and unusual architecture are unique and enchanting, and the idea of a romantic ride on a gondola is iconic to the city. 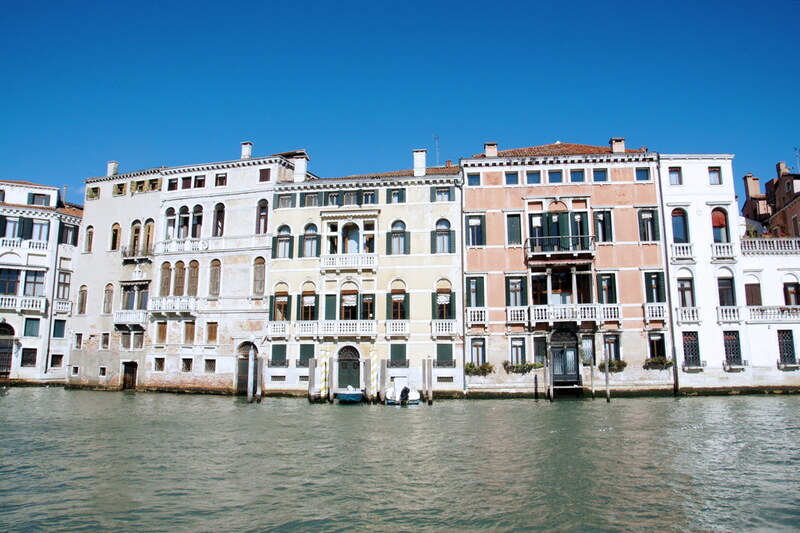 We have booked a room for three nights at the Palazzo Paruta hotel in Venice, Italy and we’re about to arrive! 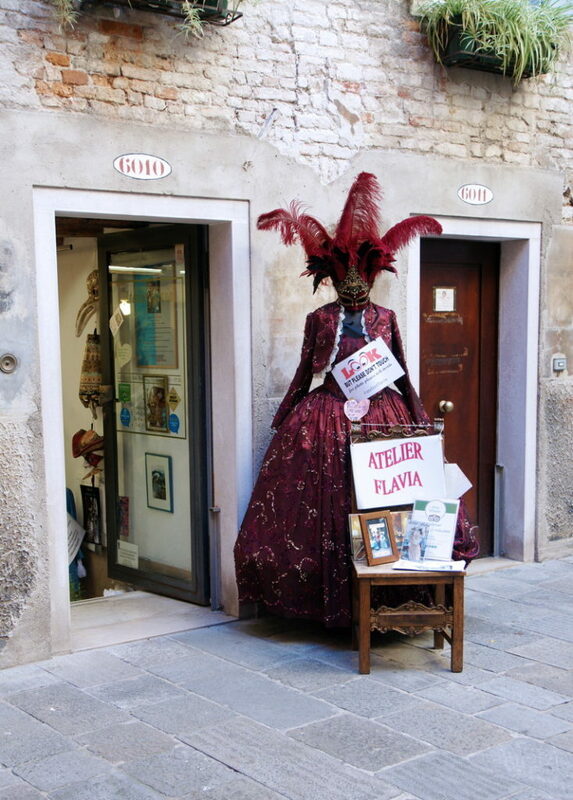 Venice is easy to find; there is an abundance of signs along the highway. We follow SR 11 from the mainland across a long bridge and park in Garage San Maraco, a public parking garage in Piazzale Roma. We’re not sure how to find a water taxi, so we follow other people pulling suitcases. As it turns out, it’s pretty easy. The maps are simple to read in any language, so as long as you know the nearest stop to your destination, you can’t go wrong. A water taxi in Venice, Italy. The architecture draws our attention. 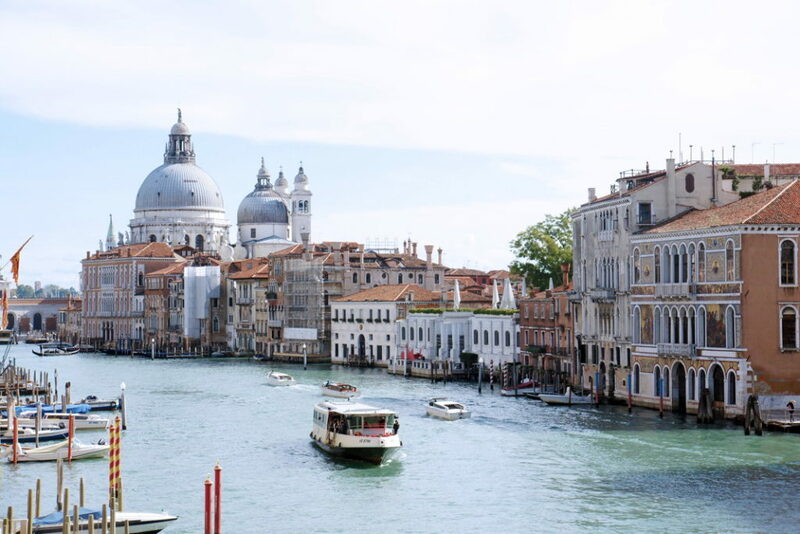 Not only are the buildings built (seemingly) on water, but many strive to look “Renaissance”: stone columns, balconies, arches, arcades, towers, spires, and filigree. Other buildings, except that they are on water, look little different than other old building found in Europe. We pass dozens of structures, captivated. We de-boat at our stop, Sant’Angelo, and start looking for the hotel, only to realize there are few “streets” here, but rather passageway connected by arched bridges. 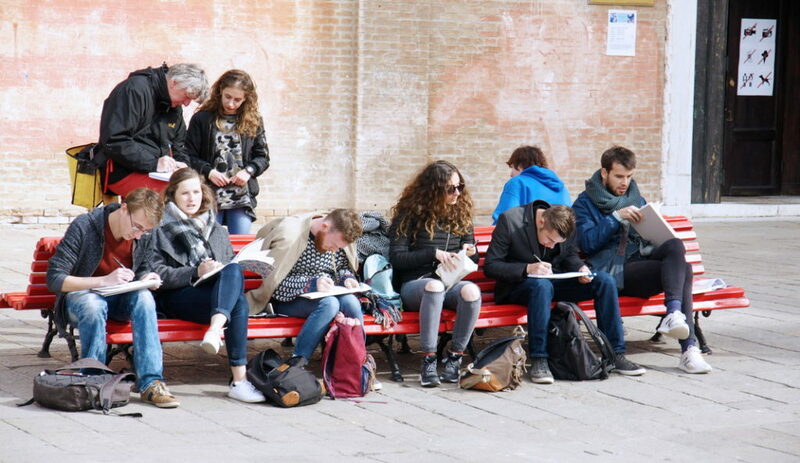 We wander, hoping we are going in the correct direction, and eventually come upon a large square, Campo Sant’Angelo. And there is the Palazzo Paruta hotel, our destination. Palazzo Paruta lobby, featuring mini-David. 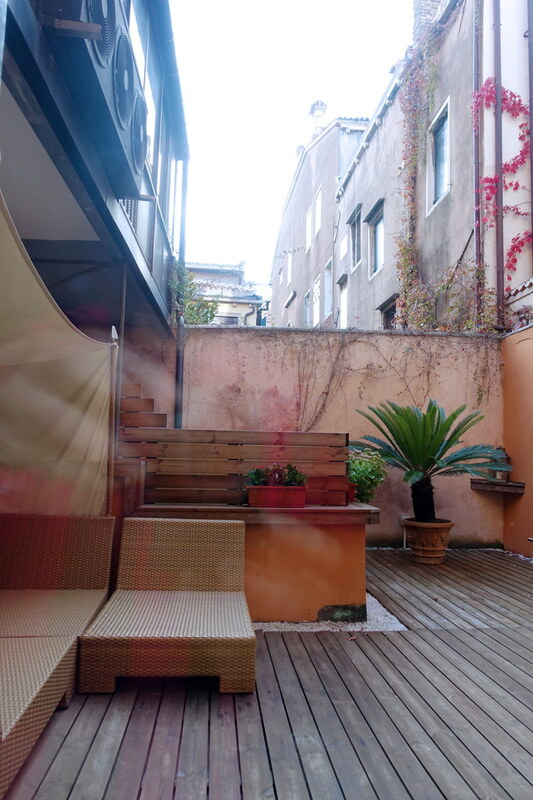 The lobby is as much outside as inside, and is a quiet retreat from the noise of Campo Sant’Angelo. 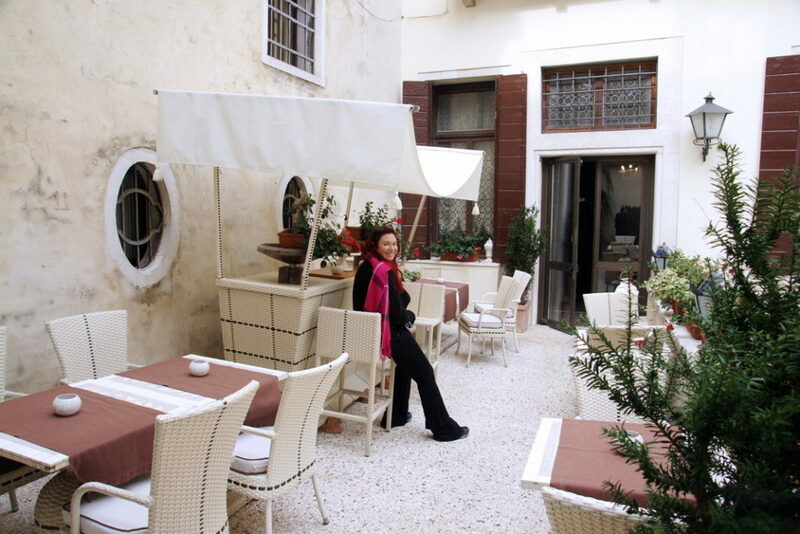 Palazzo Paruta outdoor terrace off the lobby. There is a lovely dining area just off the lobby, empty now because it’s still early. 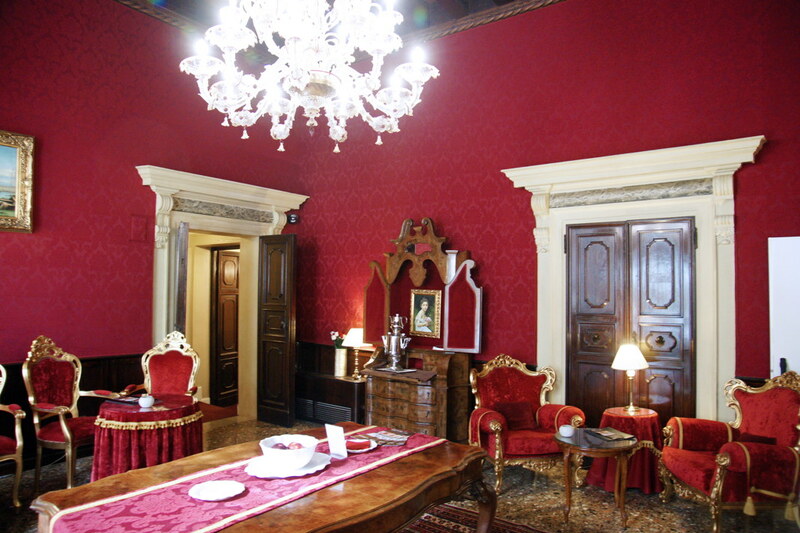 Palazzo Paruta formal sitting room. The formal sitting room seems like a scene from the time Venice was an international financial center. We check in and are escorted to our room, which is in their annex building about 50 meters away. 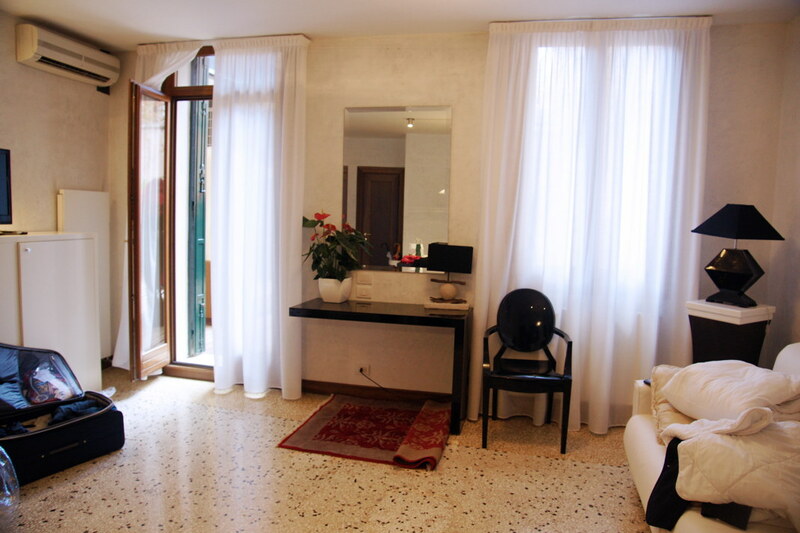 We have a 1-bedroom deluxe apartment with two baths, a full kitchen, and a terrace. And we are happy. The living room in our deluxe apartment at the Palazzo Paruta hotel. The living room is surprisingly large and the furniture is soft and plush. It feels classy. Art in the style of Venice. There is an art structure here. At least, we think it is art. We can’t even guess what it might represent. Notice the key fob in the wall: the electricity will not work unless the key fob is there. This prevents us from leaving lights and appliances on when we are not in the apartment. Well. 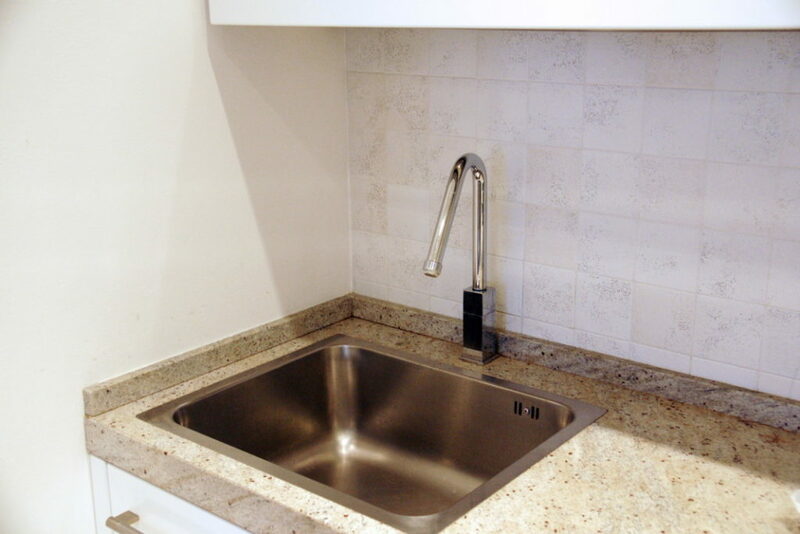 Doing the dishes might prove challenging. The terrace to our apartment. 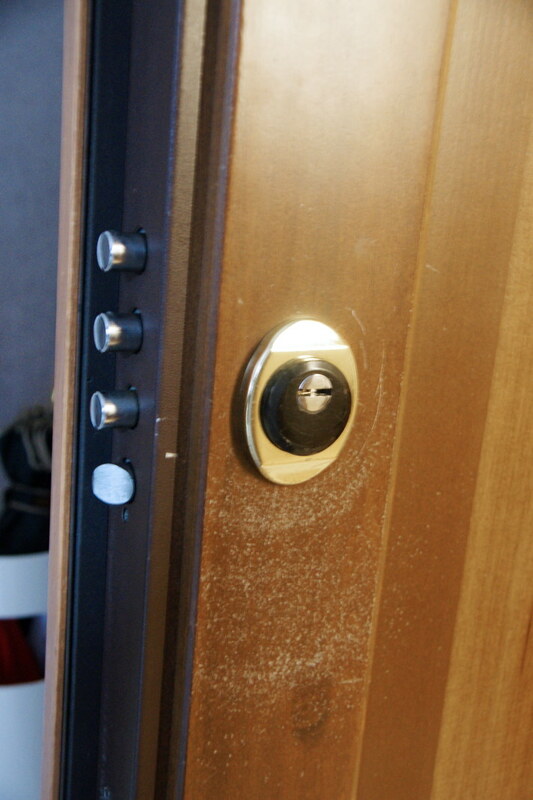 We feel secure in our apartment. There is an outer door to a vestibule, and a door to our apartment. I’ve seen bank vaults with less secure locks. But first, lunch. 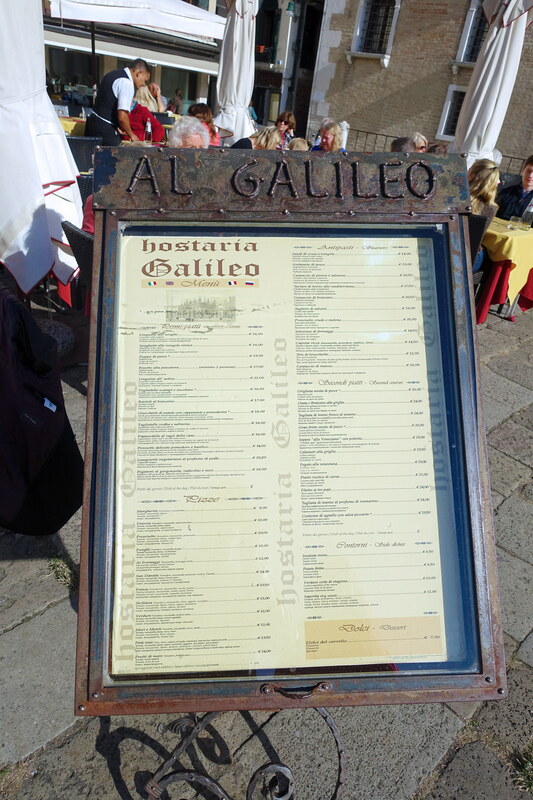 And luckily, there is a restaurant in Campo Sant’Angelo, the Hostaria Galileo. We find an empty table and seat ourselves. Lunch at the Hostaria Galileo. After lunch, we set out to explore the most famous icon of Venice, the gondolas. A Gondola craftsman at work. 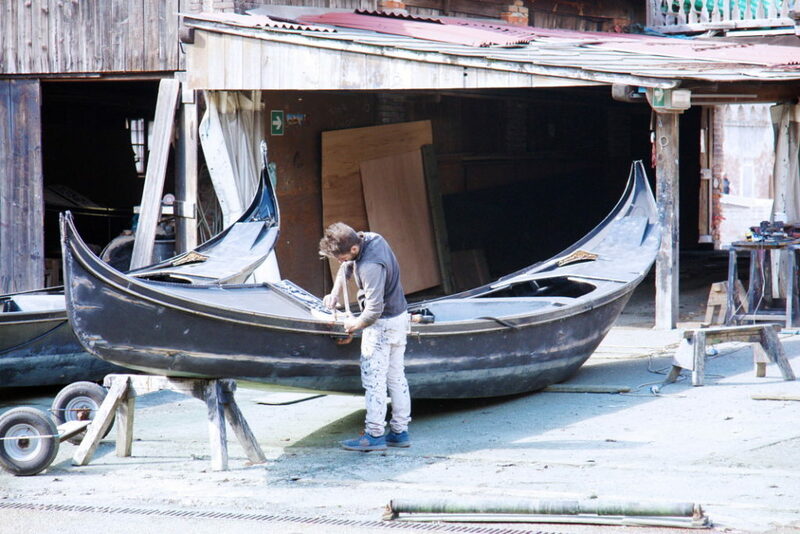 The Venetians take their gondolas seriously, and scrupulously maintain them. Plush seating in the gondolas. 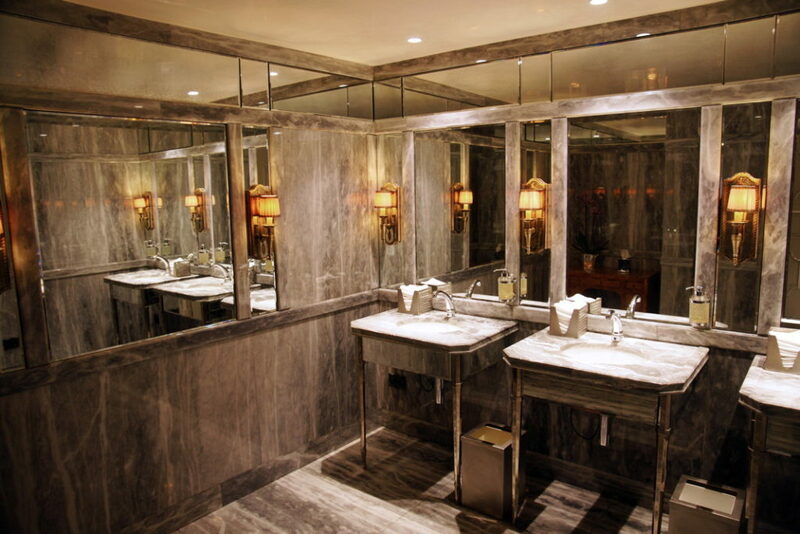 The interior of the gondolas is well appointed, as if for royalty. 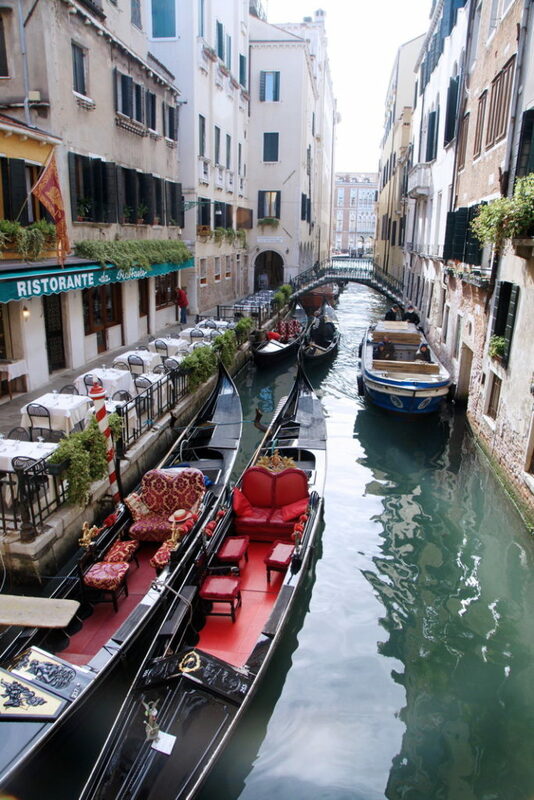 Now, this is how we imagined traveling in Venice via gondola: classy, cultured, elegant. We were mistaken. 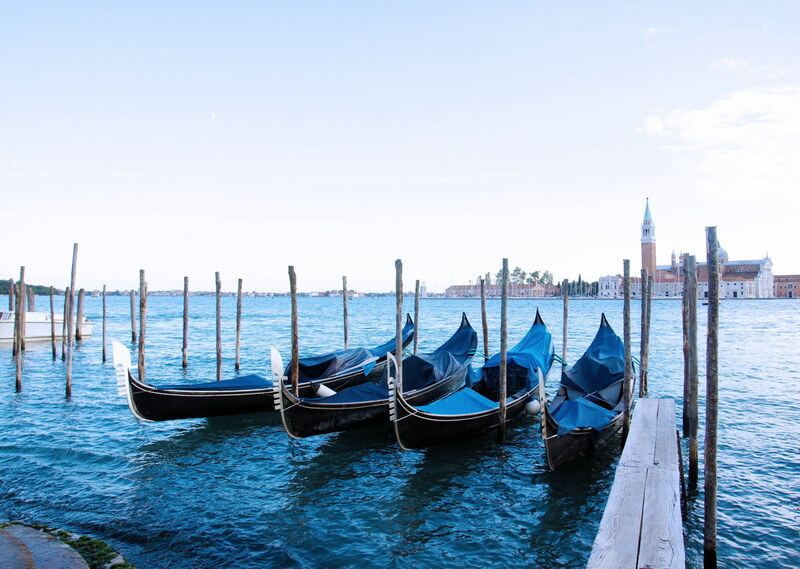 Gondola rides for tourists are a staple activity in Venice, and they are in abundance. A line of gondolas in Venice. 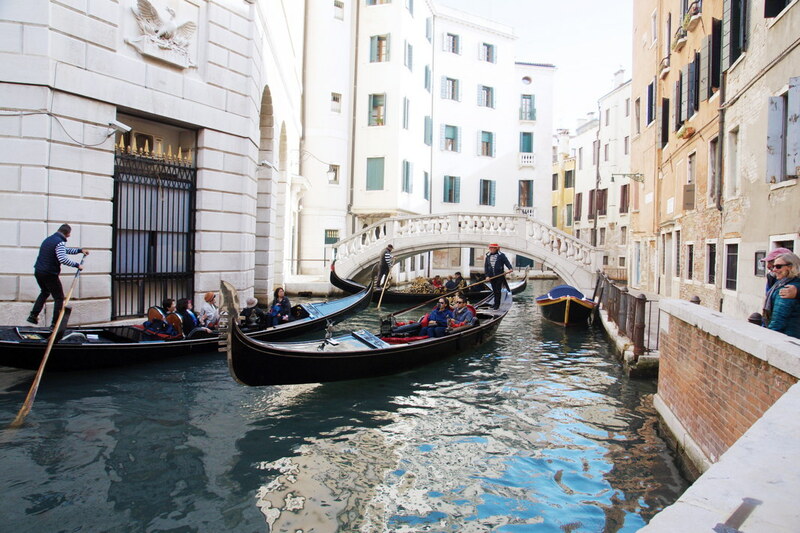 Groups of tourists share a gondola, and the lines of gondolas are endless. Wait. Is that supposed to happen? 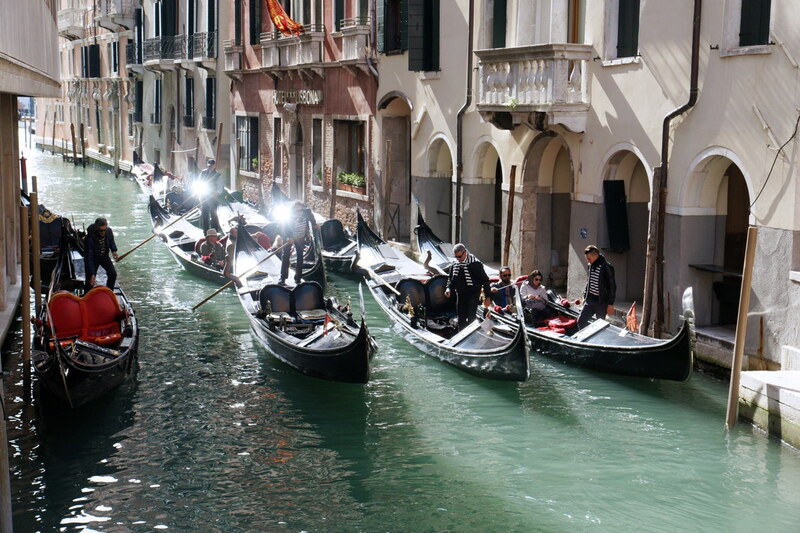 Some of the gondola drivers are a bit more cavalier in their attitude towards upright boating. Even gondolas have to deal with cross-traffic. Other tourists watch, as we do, amused by the antics of the gondoliers. Okay, enough photographs. 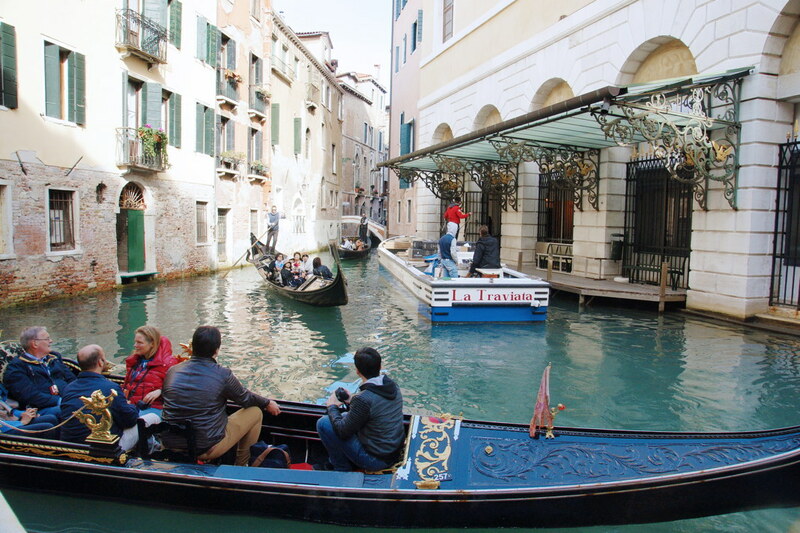 Gondolas are nice, but just not quite the romantic adventure we expected. We decide that we will be satisfied with observing, and leave the actual experience to others. The courtyard near our hotel. 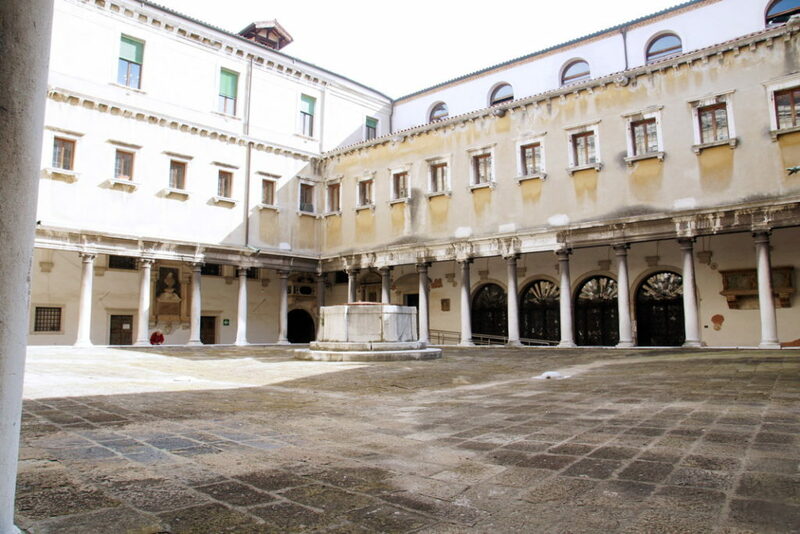 We walk through a narrow passage way near our hotel and discover a beautiful colonnade in an empty courtyard, with no indication of what it’s for or why it’s empty. 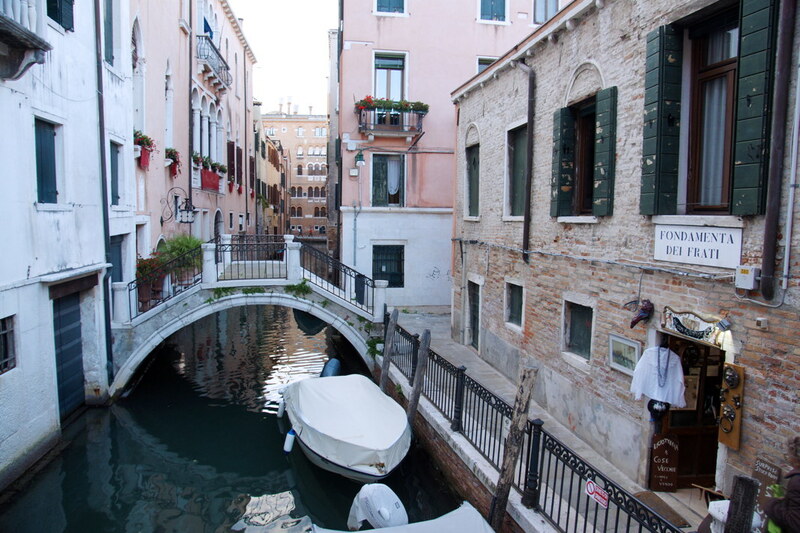 We stop for a moment to take in the beauty, wondering if the average Venetian appreciates how special such places are. 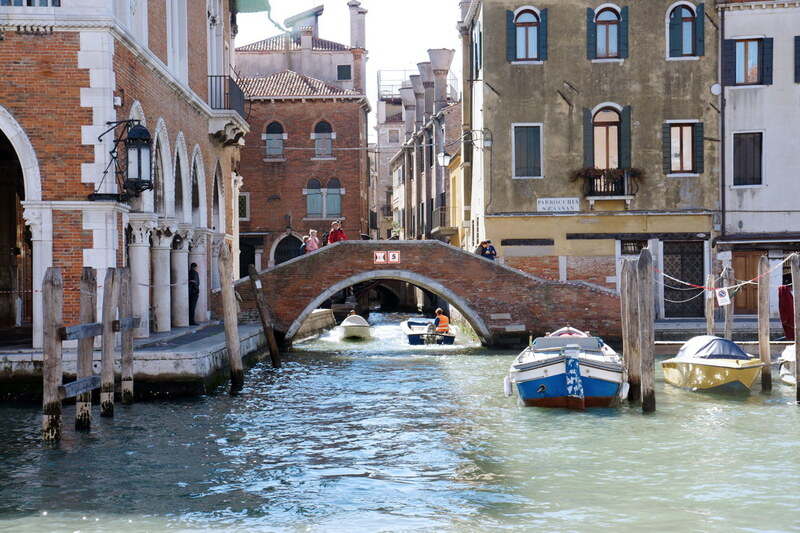 A typical arched bridge in Venice. 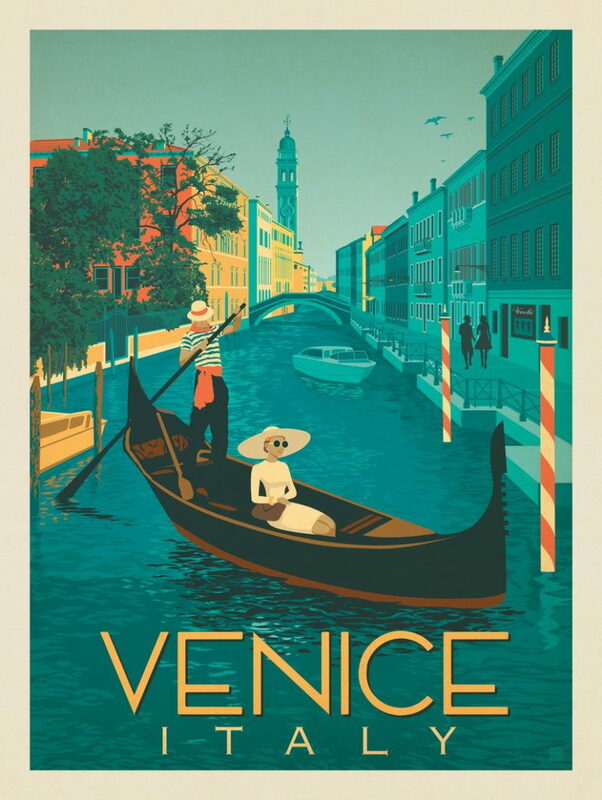 Venice is a series of narrow walkways and arched bridges, punctuated with large piazzas (squares or courtyards); There is scarcely any vegetation aside from what’s growing in the water. Frequently, the piazzas have a church associated with them, and those churches are splendid. 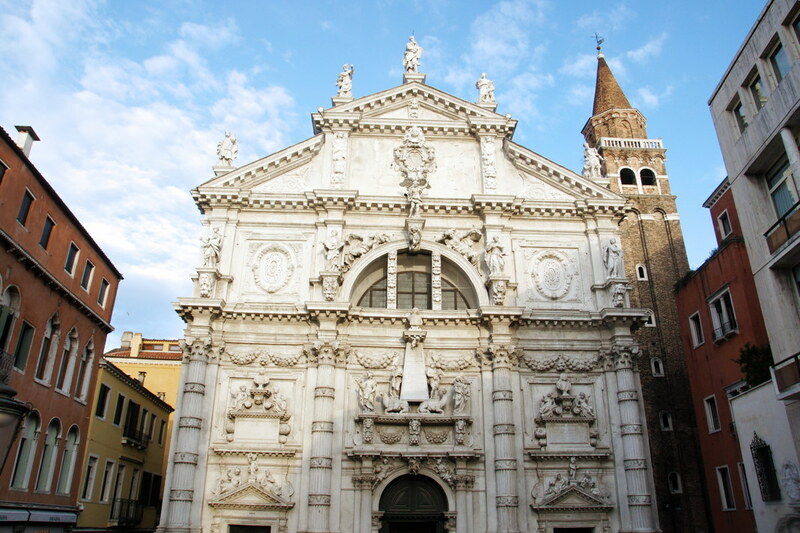 The Basilica di San Giovanni e Paolo, known in Venetian as San Zanipolo, is one of the largest churches in Venice. The Basilica di San Giovanni e Paolo was built in the 1400s, and is designed in the Italian Gothic style. 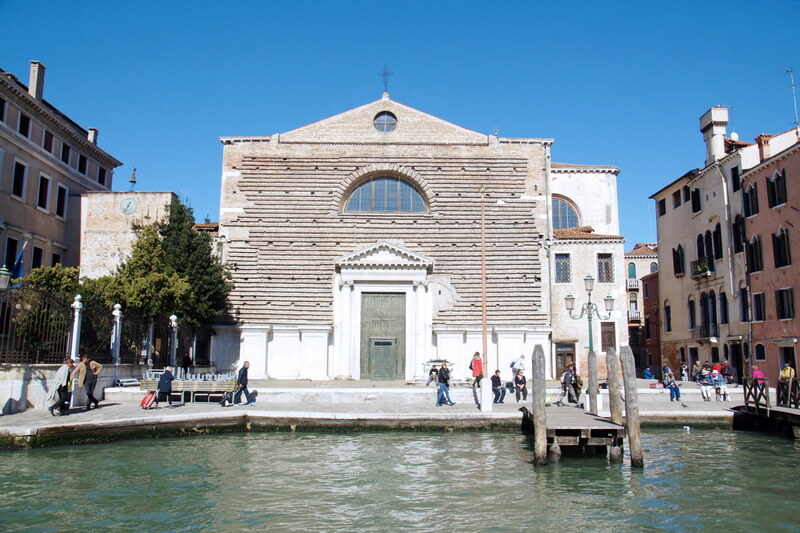 It is the principal Dominican church of Venice, built specifically to hold large congregations. The equestrian statue is of Bartolomeo Colleoni, a 15th century condottiero (mercenary) who commissioned the statue himself. 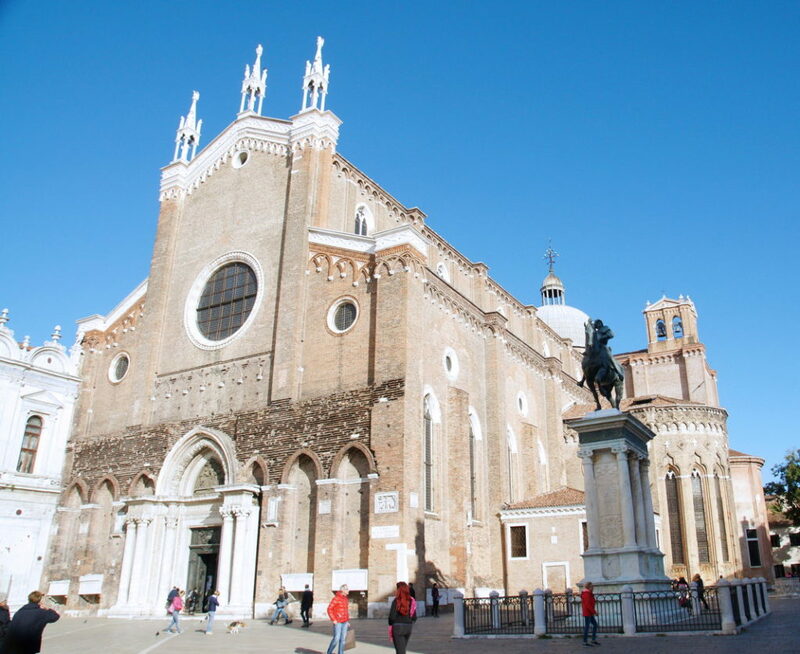 The Basilica di Santa Maria Gloriosa dei Frari, where Titian, the most important member of the 16th-century Venetian school of painting, is interred. 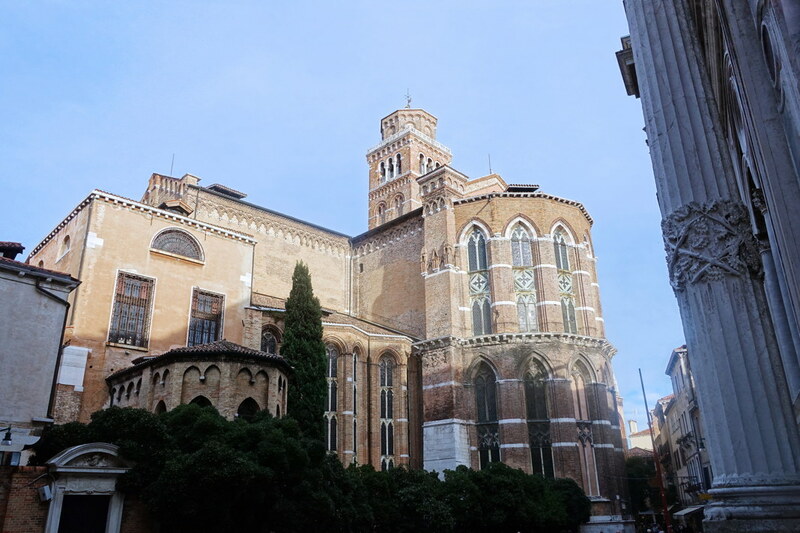 The transept of the Basilica di Santa Maria Gloriosa dei Frari. This church is owned by the Franciscans. 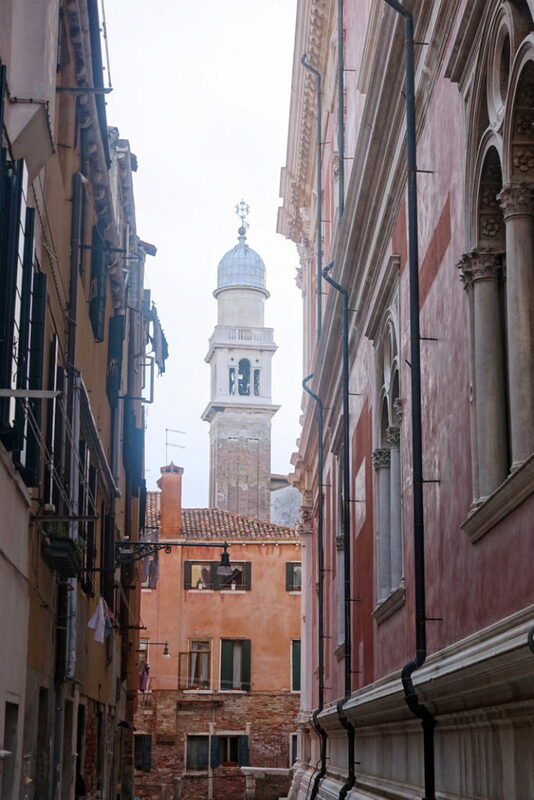 The campanile is the second tallest in Venice (after that of San Marco). Campanile di San Marco, the bell tower of St Mark’s Basilica. The Campanile di San Marco stands 98.6 meters tall, and is the bell tower of Basilica Cattedrale Patriarcale di San Marco . It has five bells, each with a special purpose. The Renghiera (or the Maleficio) announced executions; the Mezza Terza proclaimed a session of the Senate; the Nona sounded midday; the Trottiera called the members of the Maggior Consiglio to council meetings and the Marangona, the biggest, rang to mark the beginning and ending of working day. And, if you are musically inclined, you will be pleased to note they are tuned in the scale of A. The Lion of Venice is an ancient bronze winged lion sculpture in the Piazza San Marco. 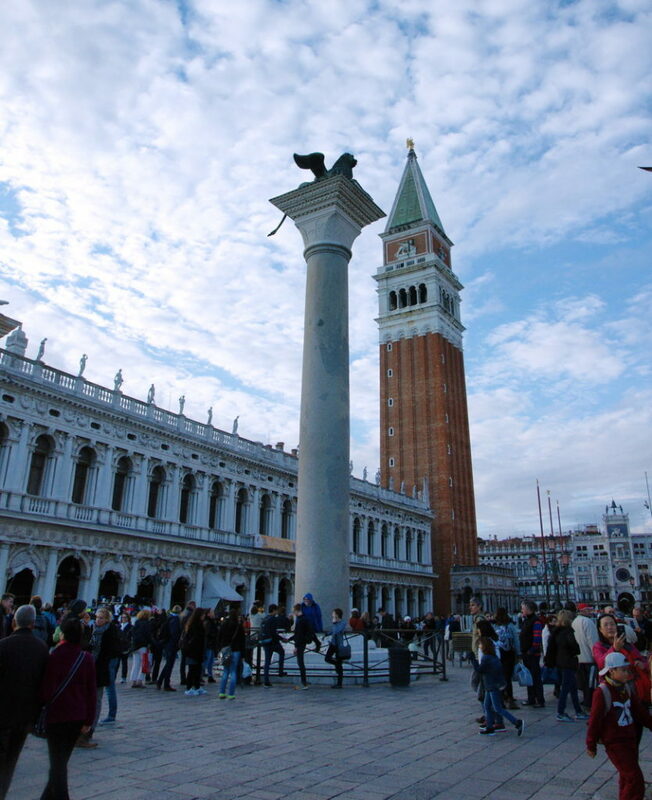 The Lion of Venice, atop the column, is said to symbolize the city as well as one of its patron saints, St. Mark. It is a composite of several different pieces of bronze created at different times, the earliest being between the end of the 4th and the beginning of the 3rd centuries BC. The Lion of Venice, in a stylized form, appears on the flag of Venice. 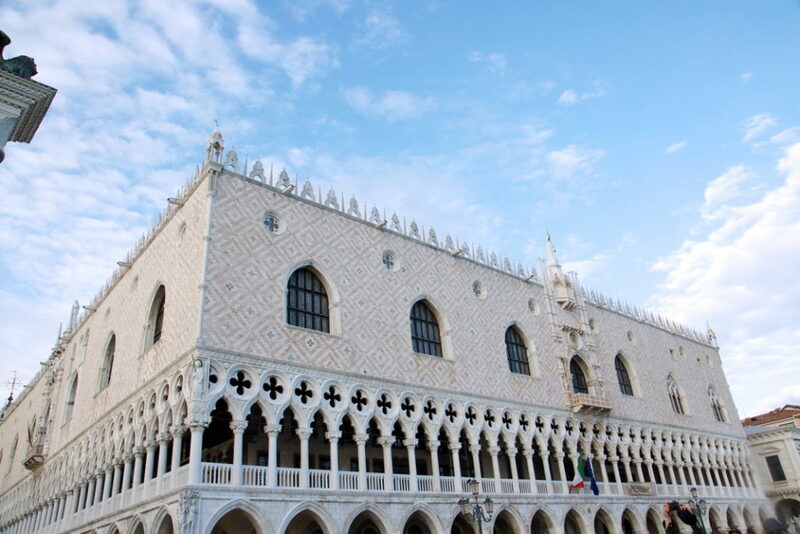 The exterior of Palazzo Ducale in Piazza San Marco, now a museum. 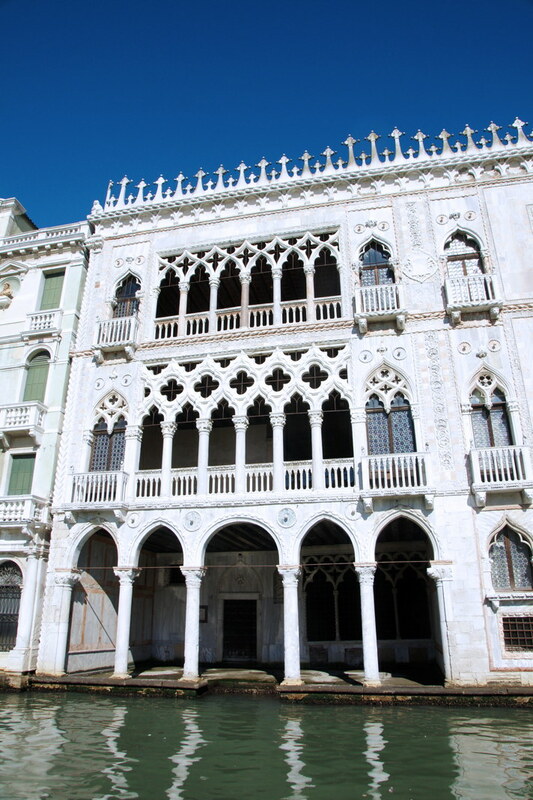 Palazzo Ducale was the residence of the Doge of Venice, the supreme authority of the former Republic of Venice, opening as a museum in 1923. 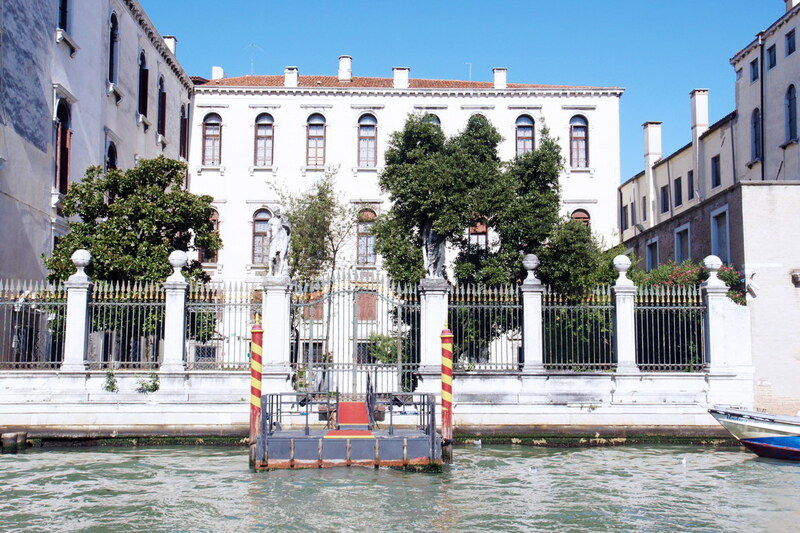 Today, it is one of the 11 museums run by the Fondazione Musei Civici di Venezia. The Chiesa del Santissimo Redentore, built in the 16th-century. Note the large minaret crowning the church, suggesting Turkish influence. 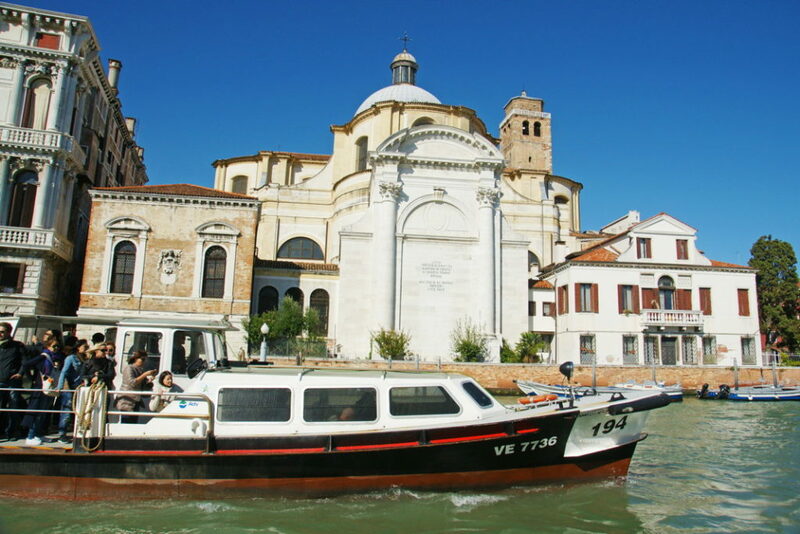 The Chiesa del Santissimo Redentore, viewed across the Canale della Giudecca. Note that the church is crowned by a large minaret, suggesting Turkish influence. 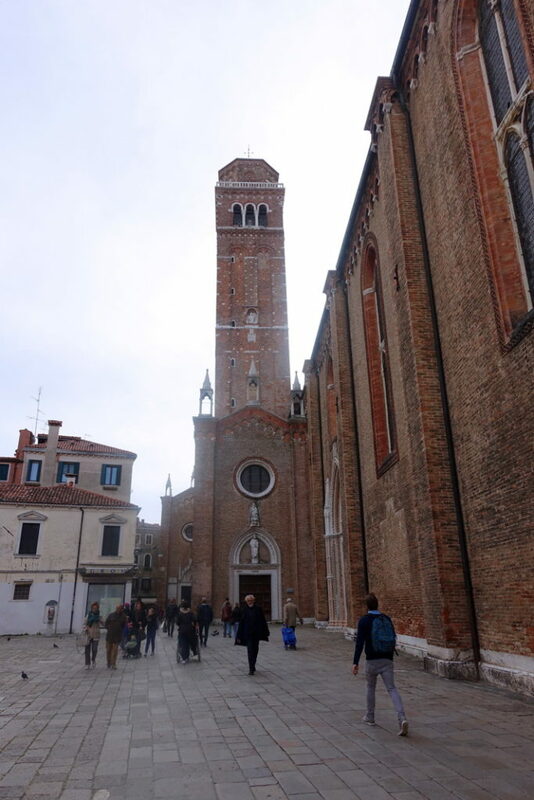 The church was built as a votive church in thanksgiving for deliverance from a major outbreak of the plague that decimated Venice between 1575 and 1576, in which some 46,000 people (25–30% of the population) died. Note that the plague killed up to 50% of the population of crowded cities, so cutting the number in half must have seemed divine intervention at the time. The Chiesa di San Moisè was built initially in the 8th century; it is dedicated to Moses of Old Testament fame. The Chiesa di San Moisè, dedicated to the Egyptian Moses, of biblical fame, is also dedicated to Moisè Venier , who funded the reconstruction in the 9h century — hence the church’s name. The bust over the door is that of Vincenzo Fini, who funded the Baroque facade in the 1600s. Because statues in public spaces were forbidden in Venice, Fini circumvented this ordinance by placing his likeness on the church’s facade. The bell tower of the Chiesa di San Pantaleone Martire, located on the Campo San Pantalon. The fabulous bell tower of the Chiesa di San Pantaleone Martire. According to this Venipedia article, “The of (sic) Bell Tower of San Pantalon was built at an unknown date by an unknown architect…The shaft of the bell tower has an unknown number of arches on the front, an unknown number of arches on the left, an unknown number of arches on the right, an unknown number of arches on the back. There are an unknown number of steps. The belfry is made of an unknown material with its bells supported in an unknown fashion.” 🙄 Despite being overwhelmed by these facts, we are intrigued by finding yet another example of a religious structure crowned with a minaret. 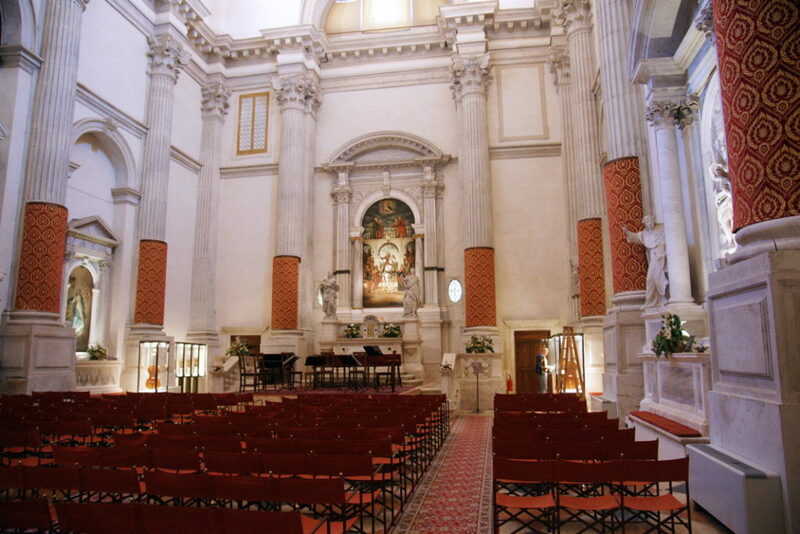 A view of the interior of San Vidal, a former church and now an event and concert hall. San Vidal is one of the few churches we venture inside. It is empty save for one other person and, as you might expect, it’s quite beautiful. The Basilica of Santa Maria della Salute, built in the 1600s as a votive offering for the city’s deliverance from the plague. 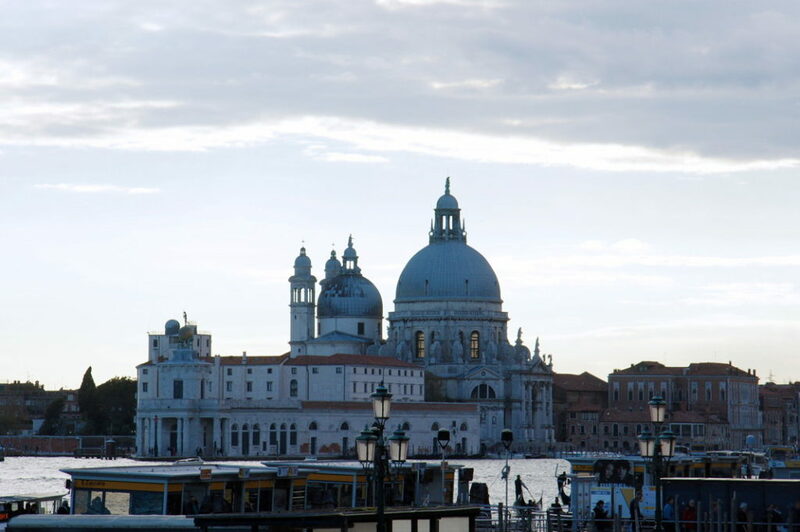 The Basilica of Santa Maria della Salute is another church built as an offering for Venice’s deliverance from the plague. This one is dedicated to Jesus’ mother and is pivotal in the annual festival. Again, notice the minaret, which seem to be thematic to the larger churches. 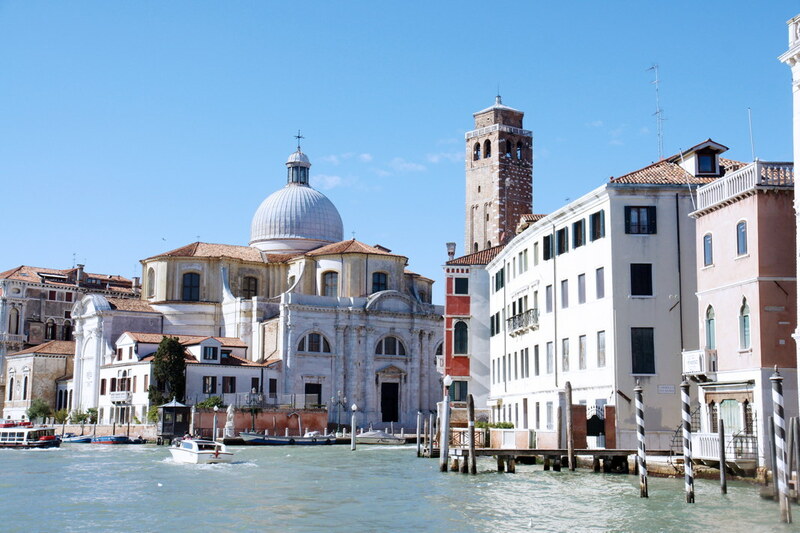 A view of the Basilica of Santa Maria della Salute along one of Venice’s canals. 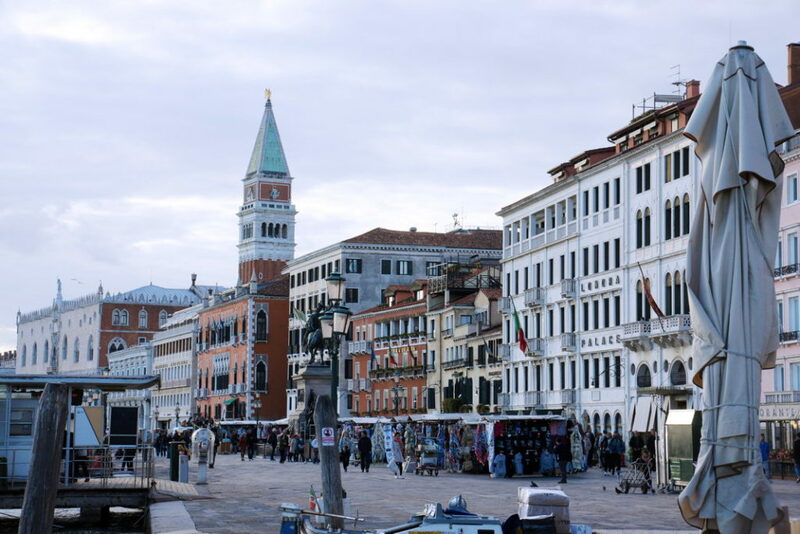 This photograph shows a typical, perhaps classic, experience of our visit to Venice: waterways, colorful pilings, builds on the water, boats, and a beautiful building in the background. The Scuola Grande di San Rocco, noted for its collection of paintings by Tintoretto. 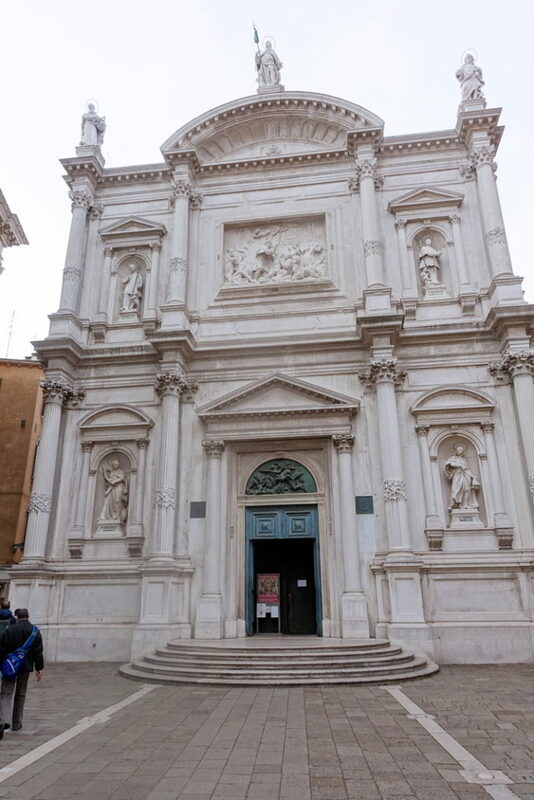 The Scuola Grande di San Rocco is named after San Rocco, popularly regarded as a protector against plague. It is the seat of the lay confraternity La Scuola Grande di san Rocco, which was founded in 1478 and is still active today, carrying out its traditional charitable duties as well as looking after its extraordinary artistic patrimony. Okay, we are hungry, and it’s time to experience a taste of Venetian fine dining. We get dressed, pause to take a quick photograph of ourselves (see above), then walk to a restaurant just around the corner from our apartment. 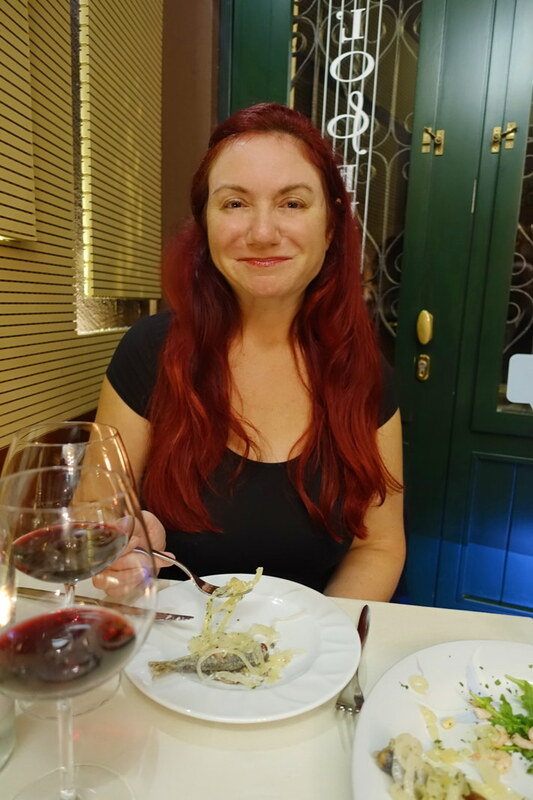 Ristorante L’Opera in Venice, Italy. 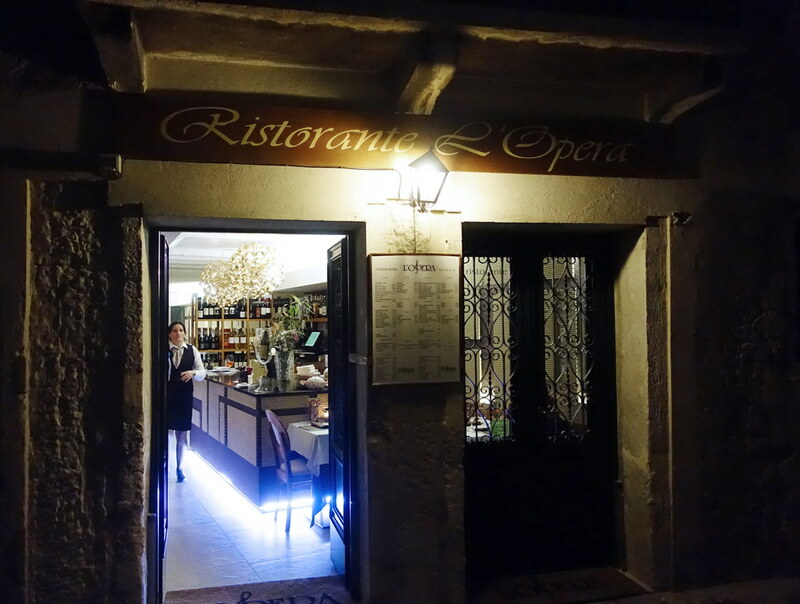 Ristorante L’Opera is an elegant restaurant with few other diners. We are greeted as we approach, and we select a table near the front. 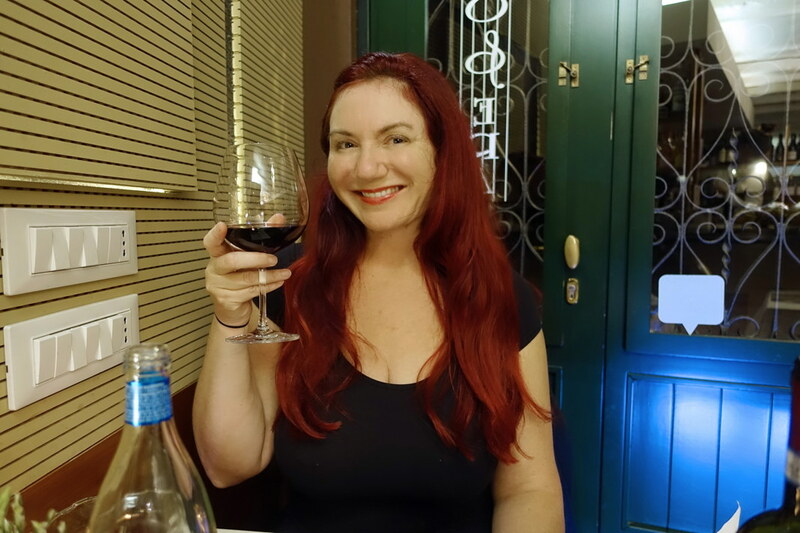 First things first: a glass of delicious Italian red wine. Mmmmmmmm. 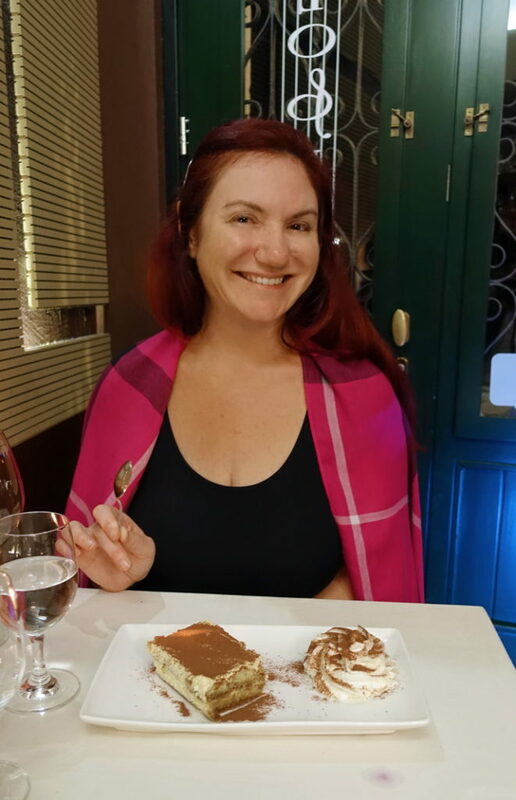 We are in Venice, so we order, not really sure what we are selecting but trusting the epicurean sensibilities of the cook. 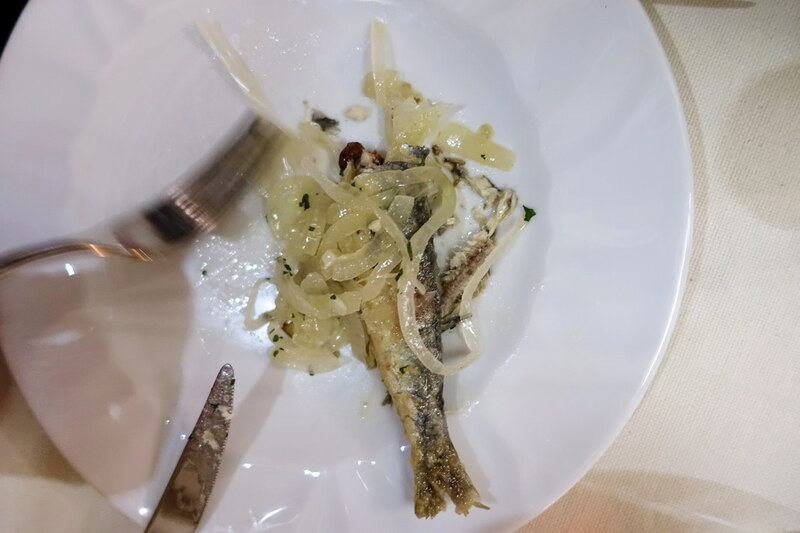 Hmmmm, we seem to have ordered cabbage on a small, whole fish. Oh, well. 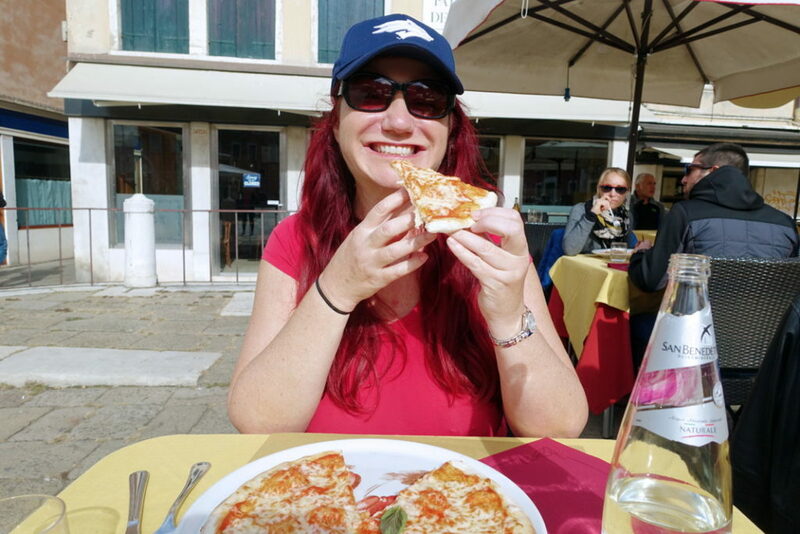 When in Rome…er, Venice…. We walk back to the apartment, have a good night’s sleep, then strike out in the morning. 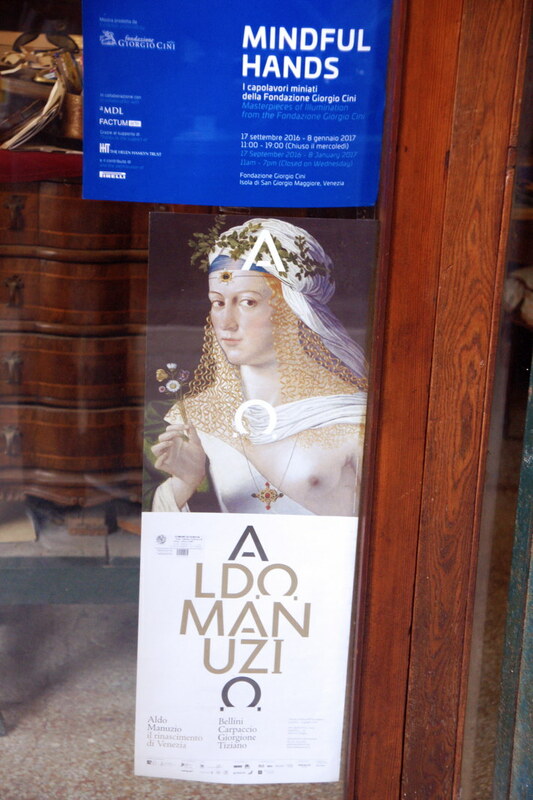 Today we will eschew architecture and buildings, and instead focus on all the other sights and sounds of Venice. One of the many shops selling Carnival masks. I think that’s C-3PO in the lower left. One of the most recognized Carnival mask is the Medico Della Peste, the “Plague Doctor“. The beak held spices to protect the doctor from miasma while tending to patients. “Mindful Hands”, making off-the-shoulder dresses look GOOD. 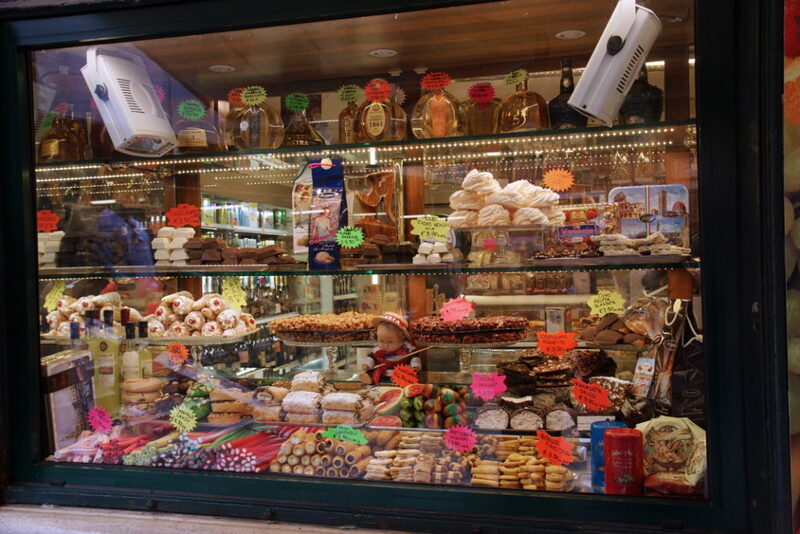 The Italians enjoy their sweets! We do not find too many sweet shops in Venice, but with a selection like this, they need only a few. 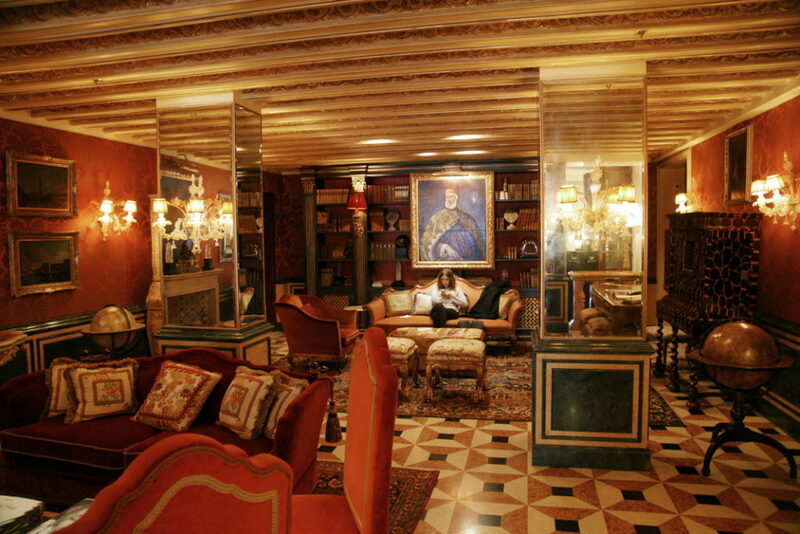 A sitting room at the Hotel Gritti Palace in Venice. 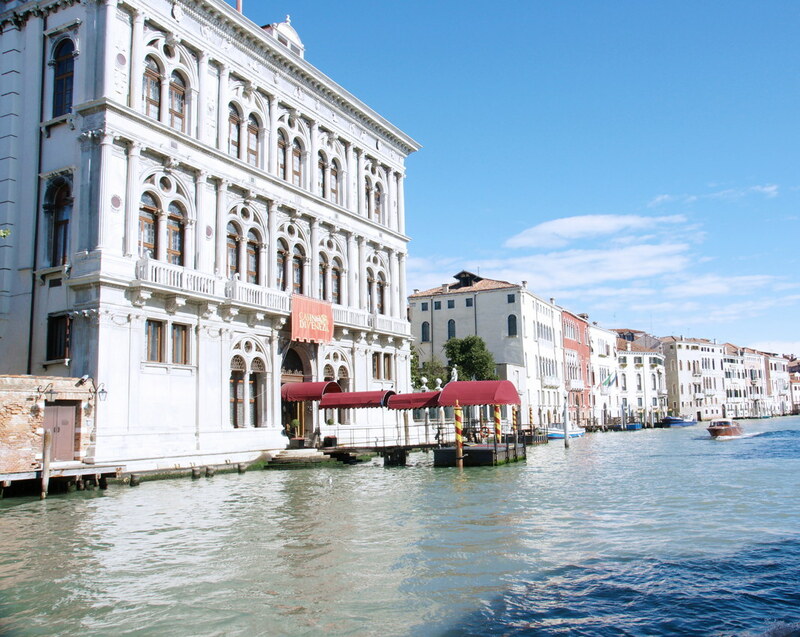 We come upon Hotel Gritti Palace and decide to take a look inside. Wow. This really is a beautiful hotel. The men’s room at the Hotel Gritti Palace in Venice. 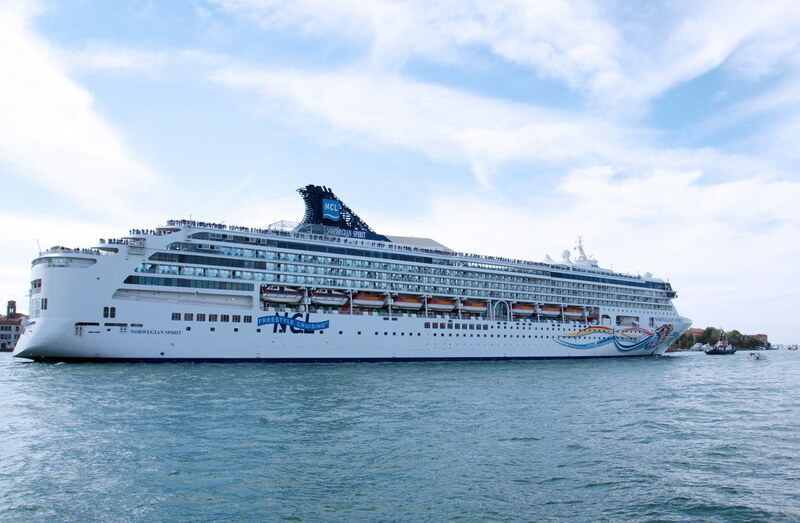 One of the many cruise ships to visit Venice. Occasionally there are pulses of tourists that seem to pull you along. And this is why: thousands of tourists disembark and quickly rush about, taking in as much as they can before they must return. 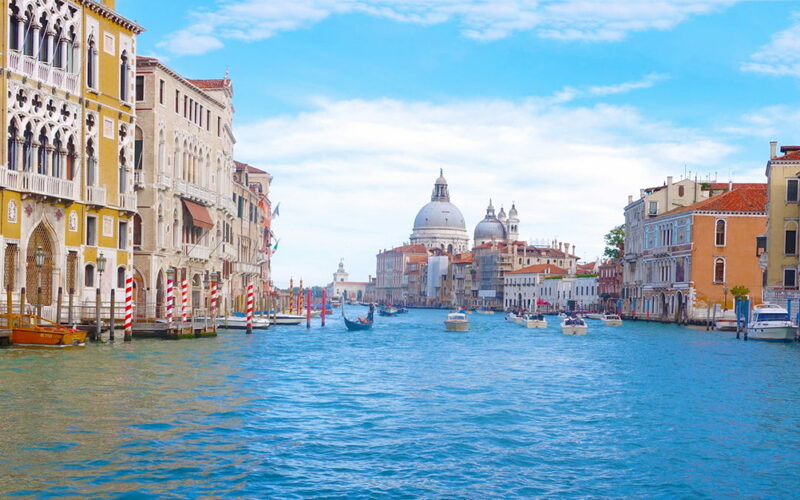 We later discover that we are not the only ones finding this to be less than optimal; Venice has decided to ban large cruise ships in the near future. We approve. Venice is more than canals and churches. This city has produced numerous artists and perhaps these folks will one day be added to that list. What do Venetians wear when they go out in style? We don’t know because we can’t tell the locals from the tourists. 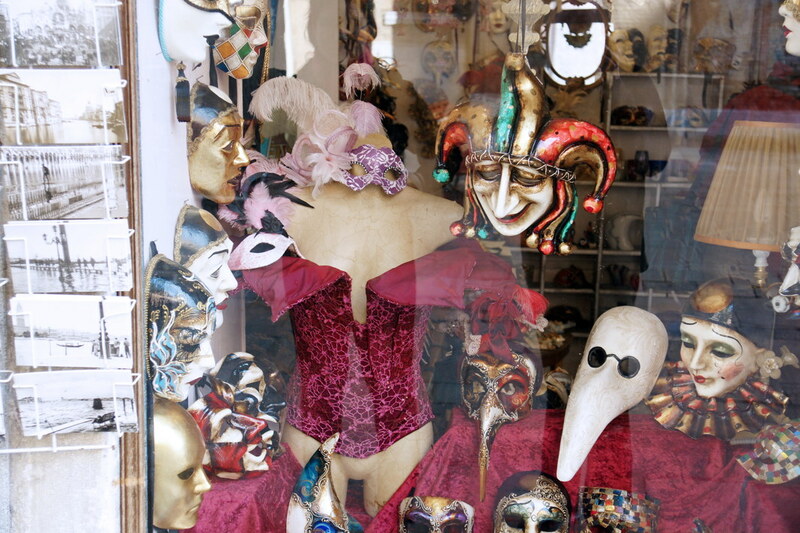 But we can make a note of what sells in Venice’s clothing shops. Man on ice cube with parts of a polar bear. 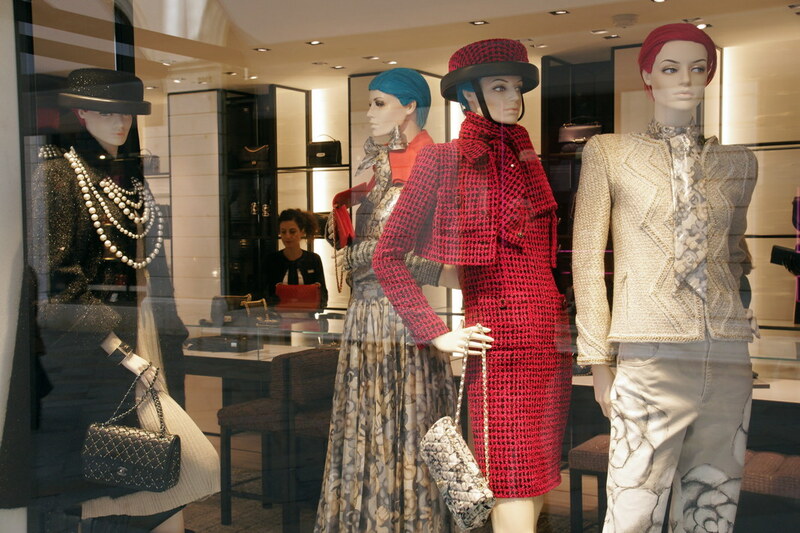 Like most people, we might admire fashion, but don’t expect us to understand it. 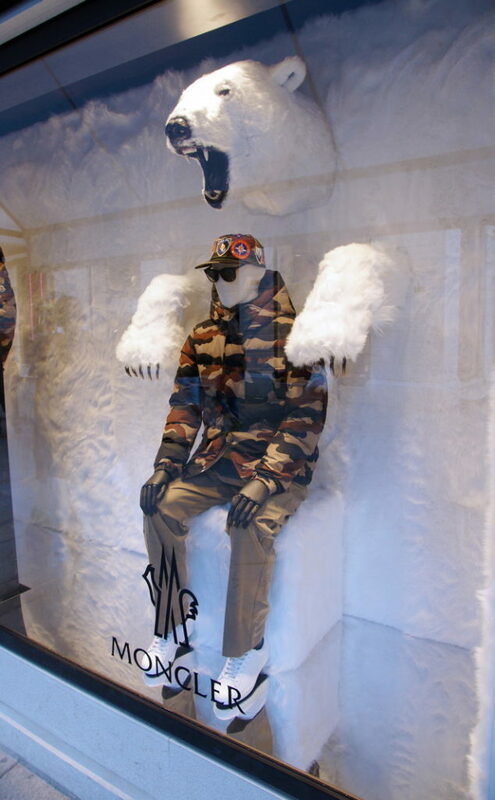 Is this man sitting under polar bear parts, or is the polar bear emerging from another dimension? Does it get so cold in Venice that a polar bear is a selling point? If it’s so cold that a lady must wear fur-clad high heels, my advice is to say indoors. 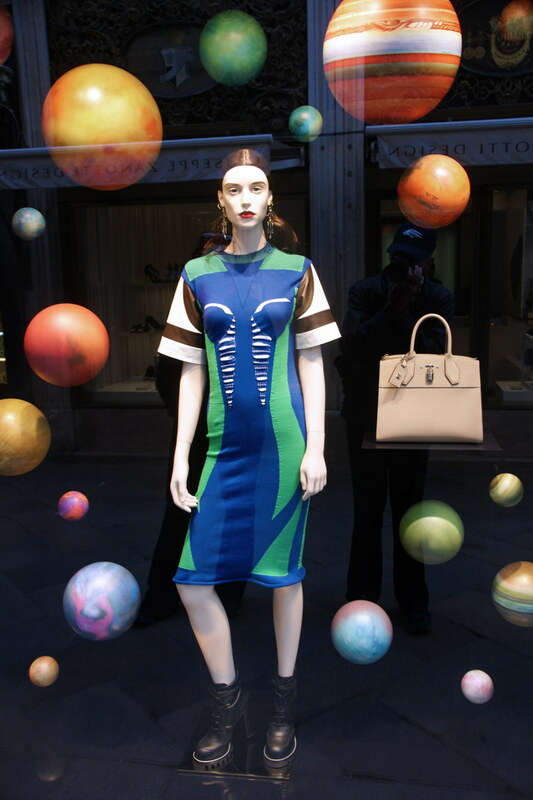 There is so much about this fashion display that I don’t understand. The hat makes the look. Elegant outfits, but what’s with the hat? Is it made of metal, and that’s why it needs to be strapped on? Does it protect from shrapnel? So many unanswered questions. But, all things must end, and our two-day excursion is drawing to a close. 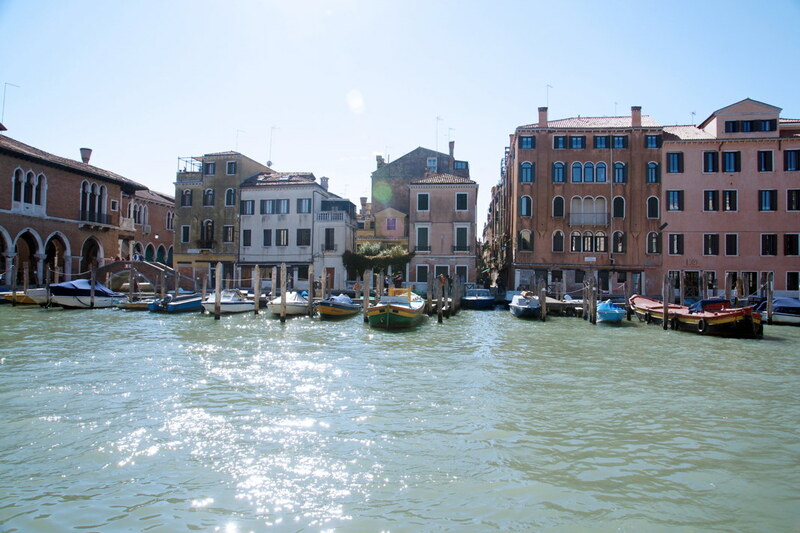 Venice was not quite what we expected, and that is why we travel. As John Ruskin once said, “Venice…A splendour of miscellaneous spirits.” We shall always cherish our memories of this grand city. awa Travels Tip: Although known for its iconic gondolas, Venice is a rich collection of history, architecture, and fashion. Get lost in this city and discover why it has fascinated visitors for 1,000 years.